Psst! There's a giveaway at the end of this post! I don't consider myself to be a very "zen" person. I've dabbled in meditation before, but nothing really stuck and I abandoned it before long. My therapist has suggested, gently, for quite some time that maybe meditation would be something that could help, particularly when it comes to having more patience with my kids. To be honest, I brushed her off. I'm pretty self-aware. Who has time for meditation anyway? As it turns out, those of us who don't have time are kiiiiiind of the ones that need it the most. I downloaded the app 10% Happier, having read the book of the same name a few years ago and really enjoyed it. To my surprise I found myself opening it frequently, almost daily, and looking forward to a quick session - even 5 minutes. I even paid for a subscription to the app, which I NEVER do. I was pretty consistent, but started to wonder what else is out there. Almost two months (and more than $50 later), I've tried many of the paid meditation apps on the app store and I'm here with my reviews. No distracting music. If I'm listening to a guided meditation, I want it to be quiet except for the person's voice. Reward me for meditating regularly. Some kind of streak tracker is really motivating. Specific meditations for different emotions, situations, and goals. General mindfulness is great, but I really wanted to be able to focus on managing frustration, anger, and impatience, as well as something energizing for the morning and relaxing for before going to bed. I just wasn't a big fan of Simple Habit, Stop, Breathe & Think, and Calm. I had previously downloaded all of them and just kind of...stopped using them after a few days. I'll be honest, I didn't dig into them at all for these reviews. So it's entirely possible that one or all of them is really kickass (and I think Calm is the #1 meditation app on the App Store, so it obviously have something going for it!) but I wanted to focus on ones I haven't tried before. All images below are from the App Store. I really enjoyed the meditation tracks on Pacifica, but the choices are really limited (especially compared to 10% Happier and Headspace). 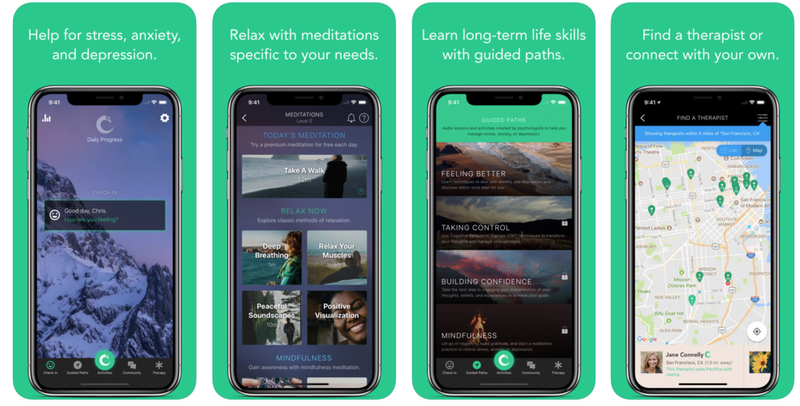 There are also four "guided paths," which the app describes as "audio lessons and activities created by psychologists to help you manage stress, anxiety, or depression." Those paths are: Feeling Better, Taking Control, Building Confidence, and Mindfulness. I didn't try any of this, but given the quality of Pacifica's stand-alone meditations I'm sure they're quite good. There's a lot of extra "stuff" in Pacifica, which makes it great if you're looking for a way to track moods and sleep habits, journal, or set goals related to your health and well-being. Ultimately this just isn't what I'm looking for and moved on to a meditation-specific app. But if you're trying to find an app focusing on your mental health in general and not just meditation, Pacifica would be a perfect choice. Price: $5.99 per month, with discounted options for yearly or lifetime subscriptions. 1. 10% Happier is kind of clunky to navigate. Lots of side-scrolling, and while I liked that there was a variety of meditations to help you go to sleep (by different teachers, which is another really cool feature), they all have very similar names and the same color icon. I would start 2-3 different meditations every night trying to find my favorite one. Melt into sleep? No. Drift to sleep? No. Drift OFF to sleep? No. Goddammit, where is my meditation? 2. While it does track how many days you've meditated and how many "mindful minutes" you've logged, there's no in-app incentive to meditate every day -- unlike Headspace, which really encourages a meditation streak and even gives you vouchers to send to your friends after you've hit a certain number of days in a row. That being said, 10% Happier is great if you're looking for something more straight-forward and a little less cutesy than Headspace. Where it really shines is the different categories of meditations and the fact that it is VERY self-aware and doesn't take itself too seriously. Take, for instance, the "Uncensored Meditations" category, which includes gems like "What the Hell Am I Doing Here?," "I Don't Want to Meditate," and "Loving-kindness for A-holes." There's also a whole technology section devoted to phone addiction, and an "Election Stress" set of meditations that are especially helpful when every day you wake up wondering what the hell has happened to our country. Honestly, if I had an unlimited amount of money to spend on app subscriptions, I'd keep both 10% Happier and Headspace. 10% Happier lets you try several free meditations, but the fun categories I mentioned above are locked until you decide to go all-in. My suggestion: just do a subscription for a month and check out a lot of the meditations. Most of them are short (although you can find longer ones if you find yourself with more than 5 minutes to meditate, you lucky person), there are a lot of different teachers, a ton of different topics, and the app creators understand that most of us are not arriving at the app ALREADY in a state of zen and loving-kindness. Price: 14.99 per month, with discounted options for yearly or lifetime subscriptions. My favorite. I love you, Headspace. You get a badge for every day you meditate and there are cute little cartoon animations. What's not to love?? Meditations for kids! Olivia (almost 3) has no interest, but Natalie (almost 5) actually really enjoys the kids meditations. They're also broken down by age, with meditations for kids ages 5 and under, 6-8, and 9-12. You can choose the duration, from 1-5 minutes, so you're not asking your kid to sit through an unbearable 20 minutes. The language is very kid-friendly and uses explanations that they can really wrap their head around. The "going to sleep" meditation, for instances, asks your child to pretend that they have a magic feather that makes whatever body part it touches fall asleep, and then guides them through a body scan with that magic feather. So cool and I LOVE the idea of introducing these concepts at such an early age. Streak tracker! I'm at 30 days and I'll be damned if I'm going to break that streak now. Granted, the way it counts your days is a little strange. Per their website: "If you complete more than 1 session in a day and they are more than 8 hours apart, your run streak will count both completed sessions as two days." So you get credit for two days if you do an energizing meditation in the morning and a go-to-sleep meditation before bed. It's a little weird, but whatever. I still love it. Easy to navigate, colorful, and a pleasure to use. This app is really well-designed. Everything just flows really well and it's much easier to find what I'm looking for than in 10% Happier. "Packs" vs "Singles." Most apps do this, but it looks like Headspace has a lot more packs (groups of meditations that are in a certain order, like a course) than the other apps. So far I've done the first "Beginner" pack, and am working on "Sleep" and "Patience." Really, really good stuff. My ONLY complaint: I'd like to see more than one single meditation per theme. I love the "going to sleep" one, but I'd like to switch it up every so often and not listen to the same track every night. They are consistently adding new singles, however, so I'm not even mad about it. This is one plus to the subscription model vs. buying an app outright: the developers are forced to add new content and improve it ALL THE TIME. Price: $14.95 per months, with discounted options for yearly or lifetime subscriptions. Obviously neither aspect of my life is perfect; I still yell at my kids and sometimes I can't sleep because my mind is generating snappy comebacks for conversations that happened 10 years ago. I do find, however, that I'm able to mentally step back a little bit and realize that yes, I am frustrated right now that nobody is listening to me and my kids won't stop pushing each other. I'm getting better at noticing and naming my thoughts and emotions and not getting totally swept away by them all the time. I can't prove this, but it does feel like I'm falling asleep faster, and having an easier time falling back to sleep when I wake up in the middle of the night. Meditation is helping me stop those random thoughts that leap from place to place while I'm trying to sleep, and instead focusing on my breath and calming my mind down enough that my tired body takes over. In general I feel slightly more in control of my mind and less like I'm just along for the ride, and ultimately, that's what I'm going for: mindfulness. Want to give Headspace a try? 2. Comment on this post on Facebook and let me know if you've ever tried any meditation apps before, or what appeals to you about meditation. Click here to be taken right to the Facebook post. Please note that you can still win even if you already have a Headspace premium account. You'll just have to wait until your subscription expires, and then apply the voucher code when you restart it. Good luck and happy meditating!